America's most authoritative markets team reveals what lessons from the past still work, what received wisdom has expired, and how to create a winning portfolio for the long run For most Americans, investing is no longer a choice, it's a requirement. With guaranteed pensions a quaint memory, dramatic changes in the stock market over the last few years have been a wake-up call; for too long, investors have simply trusted that the market would always go up. Now that we've gone from boom to bear and companies that seemed like golden nest eggs have cracked, how can people invest safely and confidently for their future? In chapters written exclusively and originally for this book, Gretchen Morgenson, Floyd Norris, and other top financial correspondents of The New York Times offer classic, time-tested advice on stocks, mutual funds, bonds, international markets, and taxes. They detail new opportunities in today's market as well as new scams, and chart investment strategies that will outlast the market's inevitable bubbles, slumps, and fads. 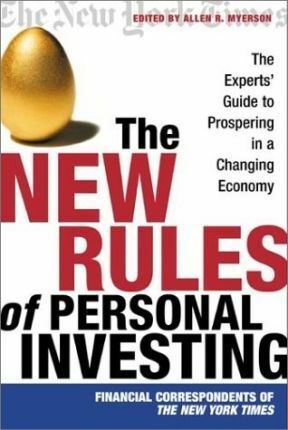 Filled with indispensable analysis, The New Rules of Personal Investing is the expert source for investing in the new (and old) economy.